Supporters of Venezuelan President Nicolas Maduro gather at Bolivar square in Caracas to take part in a signature campaign to urge the United States to put a halt to intervention threats against Maduro's government, on February 6, 2019. Canada will not provide any of the recently announced $53-million in aid for Venezuelans to governments in the region – including the administration of Venezuela’s self-declared interim president Juan Guaido – instead putting it in the hands of non-governmental organizations, mostly in bordering countries. Prime Minister Justin Trudeau announced the aid package in Ottawa earlier this week at a meeting of the Lima Group, a regional bloc working to find a peaceful resolution to the Venezuelan crisis. Speaking to reporters on Parliament Hill on Wednesday, Mr. Trudeau said all of the money will go to humanitarian organizations on the ground. “A significant part of our $53-million we announced a couple of days ago, it’s actually going to go to places like Colombia and Brazil and others that are directly supporting the Venezuelans who flee,” Mr. Trudeau said. Canada will work with established non-governmental and international groups to provide emergency food assistance, health care, water, sanitation, education and protection services to Venezuelans. However, the government won’t say which specific organizations will receive the money, citing security concerns for the groups trying to deliver aid. International Development Minister Marie-Claude Bibeau said it is too soon for Canada to provide money to Mr. Guaido, who swore himself in as leader on Jan. 23, with the support of Canada, the United States and more than a dozen European countries. “We really need a long-standing relationship with a government to decide to do what we call budget transfers, which means giving money to a government,” Ms. Bibeau said. Ms. Bibeau’s office said only a small portion of the new aid package – $2.5-million to $2.6-million – is actually destined for organizations in Venezuela to provide health-care services. 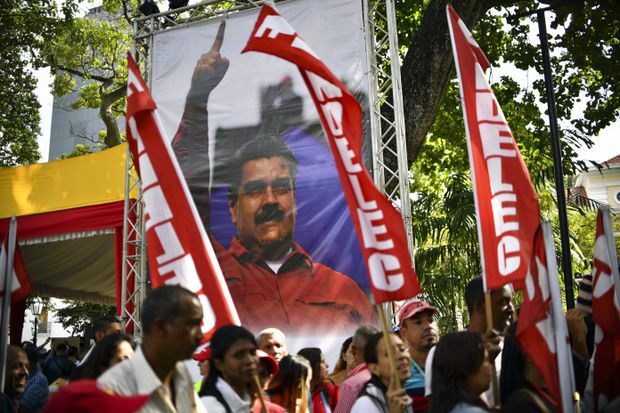 Virtually all non-government organizations and international bodies have been barred from working in Venezuela or have chosen to leave under pressure from socialist President Nicolas Maduro’s government. “There’s not so many partners in the country right now. The access for humanitarian assistance is very limited,” Ms. Bibeau said. In a tweet on Wednesday, U.S. Secretary of State Mike Pompeo demanded the Maduro regime open the border to allow for the delivery of humanitarian aid, attaching a photo of what appeared to be shipping containers at a blockade along a highway. “The Venezuelan people desperately need humanitarian aid. The U.S. & other countries are trying to help, but Venezuela’s military under Maduro’s orders is blocking aid with trucks and shipping tankers. The Maduro regime must LET THE AID REACH THE STARVING PEOPLE,” the tweet read. The Maduro regime has had a long-term policy of refusing aid, depriving the Venezuelan population of much-needed food and medicine amid an inflation rate of more than 1-million per cent. “We are not beggars. You want to humiliate Venezuela, and I will not let our people be humiliated,” Mr. Maduro said on Monday. Some South American countries – separate from the Lima Group – will meet with representatives from the European Union to discuss the Venezuelan crisis on Thursday. Uruguay, which will play host at the meeting, has remained neutral on the situation, while Bolivia still supports Mr. Maduro. Russia, China, Turkey and Iran also continue to back Mr. Maduro, whose regime has been accused of committing crimes against humanity. The Canadian aid announcement on Monday was accompanied by a Lima Group statement urging the Venezuelan military not to impede the entry of humanitarian assistance. Eleven of the Lima Group countries – Canada, Argentina, Brazil, Chile, Colombia, Costa Rica, Guatemala, Honduras, Panama, Paraguay and Peru – signed the joint communiqué. Mexico, which has remained neutral on the situation in Venezuela, did not sign on. Guyana and Saint Lucia, which have refrained from signing past communiqués, didn’t sign the document either. Tamara Taraciuk, a senior Venezuela researcher at Human Rights Watch, said only a select group of UN agencies – including the Pan American Health Organization, UNICEF and the UN Office for the Coordination of Humanitarian Affairs – are able to operate in Venezuela. Otherwise, she said Venezuelans rely on foreign food and medicine packages delivered via door-to-door courier services. “The way it works is they [UN agencies] basically have an agreement with the government in which they get some aid into the country,” Ms. Taraciuk said. Save the Children Canada’s Humanitarian Advisor, Alejandro Terrones, said that while his organization is not officially registered to work in Venezuela, it partners with vetted local partners to deliver food to children and improve children’s rights. Lindsay Gladding, World Vision Canada’s humanitarian and emergency affairs director, spoke to The Globe Tuesday from Cucuta, Colombia, a city along the Venezuelan border. She said the World Vision organization is considering starting operations in Venezuela but is cognizant of the challenges associated with getting aid into the country. In the meantime, she said Canada’s aid package is desperately needed in neighboring countries. “I saw hundreds, thousands of people probably – crossing the border this morning on foot,” Ms. Gladding said.